The step-by-step instructions simplify tapestry weaving, making it accessible and easy to do. The Workbook covers all the basics needed to get started and serves as a companion to further explorations in tapestry weaving. 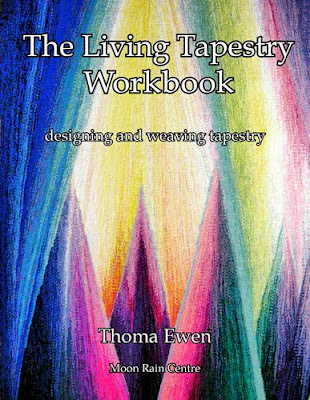 The Living Tapestry Workbook introduces the philosophy of Canadian tapestry artist Thoma Ewen, and shares her technical insights and knowledge developed over 35 years of weaving and teaching tapestry. Ewen communicates the ancient indigenous understanding that weaving is a sacred path. She illustrates how tapestry’s vital contemporary role is to transmit beauty, harmony and Peace. Labels: guide, homestudy course, Living Tapestry Workbook, manual, moon rain, tapestry manual, teaching, weaving.